With the HMV Hayate and Type 73 Small Utility Vehicle fitted with little armor and having poor defense capabilities, in 1997 the Japanese Ground Self Defense Force (JGSDF) began development of a new high-mobility light armored transportation vehicle. Capable of accommodating 4 personnel, the JGSDF Light Armored Vehicle is fitted with a 160hp liquid cooled 4-cycle 4-cylinder diesel engine, allowing it to reach top speeds of 100km/h. Weighing just 4.5 tons, it is able to be carried by a CH-47J helicopter or C-130H transport aircraft for emergency air-drops. The gun mount on the roof can be fitted with a 5.56mm MINIMI machine gun or Light Anti-Tank Guided Missile. Vehicles deployed to Iraq were fitted with reinforced bulletproof windshields, with some vehicles fitted with wire cutters and a rotational armored cover around the gun mount for extra protection. 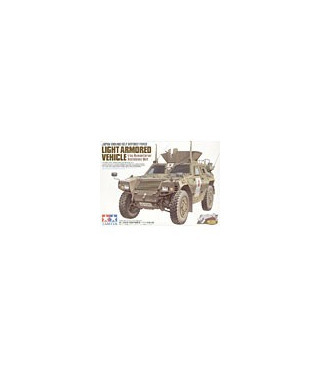 * Highly detailed 1/35 scale model of the JGSDF light armored vehicle used in Iraq. * The unique form of the actual vehicle has been accurately replicated. * Features detailed combat tires, transparent parts for headlights and tail lights, and a die-cast one-piece chassis for extra weight. * Assembly options include doors in opened or closed position, and roof fitted with a 5.56mm MINIMI machine gun with special Iraq issue armored cover or regular hatch doors. * Wire-cutters also come in the kit for a more aggressive look. * Kit comes with 1 driver figure with standard Iraq issue bulletproof vest. * Includes decals to reproduce up to 4 different vehicle markings.